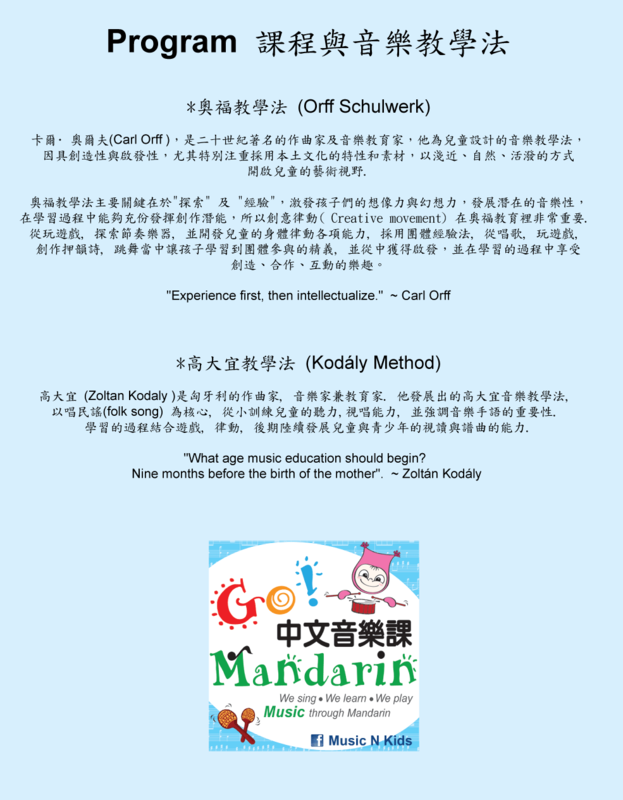 Kids Go Mandarin is a 100% Mandarin immersion program for children 0-6 years old to learn language through music. *What is Mandarin Music class? Both Mandarin and music are great foundations for early childhood language development. Children in this class become familiar with Mandarin and also build up their musical skill through music learning at the same time. "Kids Go Mandarin" founded and developed by Teacher Vita in 2012. After Teacher Vita's daughter was born, Teacher Vita tried to find the best way to keep her daughter's Mandarin education in Unite State. Realizing the importance of music in early childhood, Mandarin is also a language just like music. Her goal was to create a learning community with parents and children together. Learning a language can be fun with movement, game and also sing. Moreover, in studying Chinese music, children will grow with a stronger sense of cultural heritage and identity. Kids Go Mandarin, Mandarin learning for young children. We have exclusively designed multi-sensory creative teaching for kids and learn Mandarin through the music while providing Visual, Aural, and Kinesthetic learning. In KGM program, we incorporate Orff Schulwerk and Kodály method. Children learn through sing, dance, movement, and play. We provided “Experiential Learning” for children, and increase their enthusiasm for learning Mandarin and the basic music competence at the same time. Music is critical in early childhood development. KGM's music comes from folk song all over the world. In studying Chinese music, children will grow with a stronger sense of cultural heritage and identity. The curriculum is combining methodologies of 2 pedagogies of Kodály Method and Orff Schulwerk to build a playful musical environment for kids to learn musical skills through play. Music sources will 95% focus on Mandarin songs, rhymes and communication. What happens to the 5%? Music Is Universal. Of course, we will also learn songs from the world. We will introduce music from all around the world through music listening and movement time. Children under 8 months(0-7 months) of age at the start of class may attend FREE with a paid sibling. The discounts for multiple children apply to siblings registered in the same class only. This discount for siblings reflects the fact that each family has one registration fee and only receives one set of materials. Unrelated children must be registered separately. Early Start Music Registration is done online on this website. There are no refunds after the 1st week of the class started. Kids Go Mandarin has NO Free demo class during 10 weeks semester. Drop-ins are welcome. $25 per child per drop-in. Please buy Visitor Pass per visit. If you decided to sign up the whole semester after drop-in class, your drop-in class will be your first class and the tuition will be deducted. Kids Go Mandarin currently has very few classes for make-ups. Therefore, if you know ahead of time which classes you will miss, please send email to KidsGoMandarin@gmail.com, we can prorate your tuition up to 3 classes. NO Refund after the 1st week of the class started.